Colorize Widget is a selection of scrollable widgets. 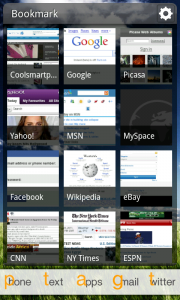 There are seven widgets for Facebook, Twitter, Agenda, Analog Clock, Messages, Contacts and Bookmarks. “Why do I need these” I hear you ask, certain home replacement apps and certain roms do not contain any extra widgets so people are left searching through the market trying to find suitable replacements. 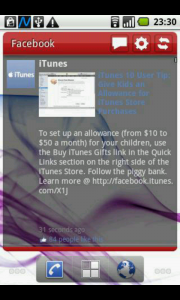 Here are some screenshots of each of the widgets. These will all let you scroll up and down the lists you have. 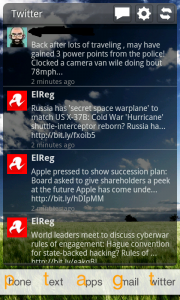 Much the same way the the htc sense widgets do. People complain that they can’t use Friendstream once they have flashed to a fancy new rom and this pack solves this problem. 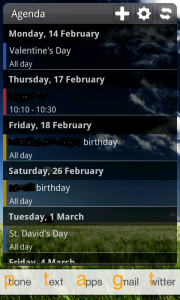 All of the different widgets come in several different colours so you can change them to suit your themes. Some of the widgets let you change other bits as well. For instance the bookmarks widget will display in either list view or thumbnail view. The contacts widget will let you view certain groups of your contacts for instance “take away restaurants”. I have been looking for decent scrollable contacts, bookmarks and agenda for a while now and these three are great. 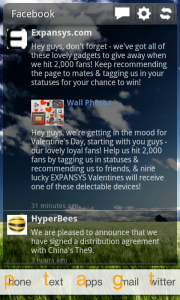 The twitter, facebook and sms widgets are a little basic but they do the job. Overall the app fills the gap left by htc sense. So if you are using ADW Launcher, Zeam Launcher or GO Launcher then head over to the market (web or device) and install it.